The best concealer for dry skin today will be nurturing, moisturizing, illuminating and sheer while covering any and all skin flaws completely. Even the slightest imperfection affecting your facial skin will virtually disappear when you select your ideal concealer. Some concealing agents may contain a combination of pure, natural products that you know to be safe along with other artificial substances that may cause some users allergic reactions or skin breakouts. Your ideal safe and healthy concealer for use on dry facial skin will have a tested formula that contains such skin-enhancing ingredients as Cyclohexasiloxane, which softens and brightens your skin while it acts as an enriching emollient and conditioner for delicate skin tissues. Natural Vitamin C will boost your skin's production of collagen, firming and smoothing your skin while improving its elasticity. Pure Vitamin E enhances long-term moisturizing of facial skin cells while protecting them from free radical damage since Vitamin E is an antioxidant. Emollients such as products made from olive oil or coconut oil will keep your skin supple and soft, helping to eliminate dry skin, lines, wrinkles and flaky patches of skin. Such natural ingredients as goji berry and glycerin are also excellent moisturizing agents. Tribehenin is a skin conditioning ingredient in concealers that produces a protective barrier on your skin's surfaces, acting to prevent water evaporation and helping to keep your facial skin well hydrated. You can select your ideal concealer for dry skin from different product types, such as liquid, creamy, and solid stick skin concealers. Some brands now offer wand applicators and airbrush effects as well. Liquid and creamy concealers have been in popular use for a fairly long time. However, the advanced formulas now available to consumers are smoother with better concealing capacities and healthier ingredients for improving skin qualities, coloration and tone. Solid stick concealers for the skin also have updated formulas today, and many products can be used without other cosmetics to conceal skin flaws while hydrating, softening, smoothing and tightening facial skin. All the best concealers formulated for use on dry skin today contain ingredients for improving the overall health, skin tones, elasticity, texture and natural vitality of your complexion for a clearer, more radiant glow. Complexion Fix is a very lightweight, gentle concealing agent and highlighter for the facial skin. Its unique formula skillfully combines excellent skincare with advanced color science to produce successful, pleasing results as a subtle, but effective concealing agent. Formula components include multiple pigments that conceal any sun spots or areas of uneven skin coloration. Dark under-eye circles virtually disappear with use of this sheer, weightless skin product. This formula supports light to medium coverage with no traces of creasing or cracking after application. The smooth, rich and creamy formula feel luxurious on your face as it hydrates and refines delicate skin tissues. This product is free of oils and paraben, and it is never tested on animals. This sophisticated product conceals skin imperfections completely with a light, radiant consistency and glow. This specialized complexion refiner is ideal of any busy woman who wants to always look and feel at her best. This advanced skin concealer contains such ingredients as Cyclopentasiloxane, Caprylyl Dimethicone Ethoxy Glucoside and Cyclohexasiloxane. Cyclopentasiloxane conditions and lubricates skin tissues while acting as a solvent, enabling other formula ingredients to dissolve thoroughly and evenly to blend more completely with other ingredients. While Caprylyl Dimenthicone Ethosy Glucoside acts as an effective emulsifier to smooth the formula's mix of components, is also moisturizes and refines your facial skin. Cyclohexasiloxane softens and vitalizes your skin as enriching emollient and conditioner for delicate skin tissues. When blended together, these three empowering substances can produce remarkable improvements in skin elasticity and textural smoothness. For sheer coverage and light moisturizing, use a small amount of this skin concealer, smoothing it even over facial skin with your fingertips. For build-able coverage and effects, apply a second coat after the first application dries. You will experience increasingly stronger degrees of improvement in the color, tone, elasticity, softness and texture of your skin with each new application of this gentle yet highly effective product. 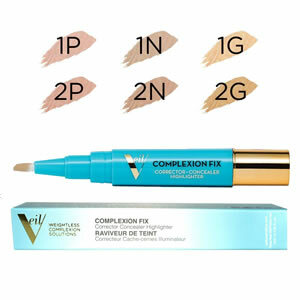 Complexion Fix is praised as the best product ever for concealing dark circles under the eyes. It conceals skin imperfections without a trace of caking or heaviness. This formula's smooth, silky consistency blends seamlessly on all facial areas. Gives your the appearance of flawless, fresh skin without wearing any makeup base. Skin may look overly shiny when using this skin concealer. 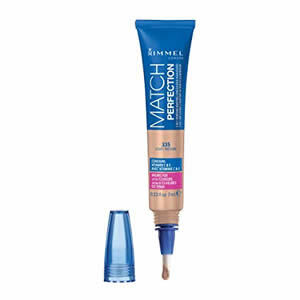 This 2-in-1 concealer and highlighter from Rimmel is uniquely formulated to conceal all skin imperfections and blemishes. This product actually adapts flawlessly to different light to medium skin tones, blending seamlessly with natural skin coloration. The soft, luxurious, precision Flow-Thru brush that accompanies this product provides smooth, easy and precise application for an even, professional yet light look and feel. You facial skin will smooth and glow with use of this specialized cosmetic product while any flaws will fade from view. There is never any caking, streaking or heavy buildup of this sheer yet concealing formula, and it leaves your skin feeling refreshed and youthful as it covers and highlights your sensitive facial skin, as needed. This innovative concealer and highlighter or the face contains natural Vitamins C and E and important ingredients. When Vitamin C is applied to your skin as a skincare product ingredient, it increases your skin's generation rates of collagen, benefiting your with firmer, smoother skin with greater plumpness and elasticity. Vitamin C's antioxidant properties also help fight against damage from free radicals and the sun's UV rays. This anti-aging activity gives you more youthful and resilient facial skin. The presence of Vitamin E in skincare formulas promotes long-term moisturizing of your skin cells while providing antioxidant benefits as well. By acting against the oxidation of sebum (oil) in your skin, Vitamin E helps to prevent the development of blemishes, enlarged pores or blackheads. This creamy, smooth concealing agent will never crease of streak on your face after application. According to regular users, this skin concealer and highlighter is gentle and soothing to dry face skin, and it is gentle even on skin that is very sensitive or prone to acne and other breakouts. Only a small amounts of this product is needed for each application, and one container lasts for as much as 5 months, even when applied twice each day. This concealer offers excellent dark spot coverage without becoming thick or oily during the day. A few customers have commented that this product is a very good highlighter, but not as good as a concealer of skin imperfections. This sheer concealer is formulated to cover skin imperfections smoothly with just a light stroke of the brush. Fine lines and wrinkles disappear as the light diffusing optics in this special formula actually brighten dull and shadowy areas of skin. This product is oil free and is designed for professional precision application. Gentle on all skin types, this airbrush concealer is neither too dewy or matte-surfaced when applied to facial skin. The airbrush applicator keeps this product free of bacteria and other germs and makes using this concealer easy while providing excellent results. With each application, any dark circles beneath your eyes will fade immediately for a more youthful, vitalized complexion. The active ingredients of this effective advanced-formula concealer from Clinique include Bismuth Oxychloride, Dimethicone and Dipropylene Glycol. Bismuth Oxychloride is a mineral that occurs naturally and is used in this makeup formula as a colorant that adds a youthful and pleasing iridescent effect to the face. Dimethicone (also known as polymethylsiloxane) is a polymer that is silicon-based and is included as an ingredient of many cosmetic products today as a skin conditioner and lubricant. Dipropylene Glycol is add to this skin concealer formula as an active solvent, aiding in thinning the product's consistency to the precise degree desired for easy, effective use. This specialized skin product formula contains no paraben, topical antibiotic, lanolin, gluten or soy, and it is free of any fragrance. This product's airbrush applicator and sheer coverage make it a delight to use. Customers report needing only a small amount of this concealer for very good coverage of darkened skin spots. This product offers light, velvety coverage for all types of skin imperfections. 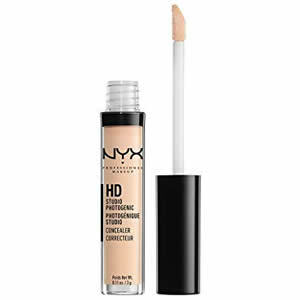 Users comment that this concealer blends well with other makeup products. Some new users of this product report that its coverage lasts only for about two or three hours after each application. This creamy skin concealer is an emollient version of Laura Mercier's Secret Camouflage. Its enriching, moisturizing formula is especially good for hydrating and refining dry facial skin. Secret Concealer easily covers dark circles under eyes and skin discoloration of varied degrees. It is especially helpful for moisturizing the sensitive skin of the eye zone, even when it has become dry and wrinkled due to lack of good hydration. Best effects can be achieved by brushing this concealer on face skin with feathery brush strokes. Be sure to include the outer corner of your eyes as well as under-eye skin when applying this product. Because this cosmetic concealer is designed with components that ensure its effectiveness as a reliable and gentle emollient, it is safe and beneficial for use on all skin types, including very sensitive skin. This product is non-comedogenic, and it has been thoroughly tested by dermatologists and ophthalmolgists for efficacy and safety for users. It offers medium levels of coverage without creasing for streaking to achieve a sheer, natural finish with good coverage. Ingredients of this innovative formula include petrolatum, lanolin and isopropyl palmitate. Petrolatum is a petroleum jelly that is derived from petroleum and is frequently included in personal care products for its smoothing and moisturizing properties. When it is refined fully and properly, petrolatum has no known health risks with regular use. Lanolin, also called wool wax, is a wax excreted by the sebaeous glands of woolly animals, usually sheep. It is used in cosmetic products as an effective emollient, moisturizer and skin refiner. Isopropyl palmitate is the ester of isopropyl alcohol and palmitic acid. In skin care products like this highly effective concealing agent, this ingredient acts as a moisturizer, emollient and thickening aid. This concealer covers red or dull areas and darkened patches of skin with one application. The rich, creamy consistency of this emollient concealer offers smooth, lasting coverage of imperfections. Long-term users reports that this product is especially helpful in moisturizing dry skin in the eye zone. This creamy concealer provides excellent coverage while absorbing well to hydrate multiple skin layers. Some customers are hesitant to use this product due to its contents of lanolin, which is an animal product, and petrolatum, which they fear may be poorly refined petroleum jelly, which can contain potentially unhealthy chemicals. 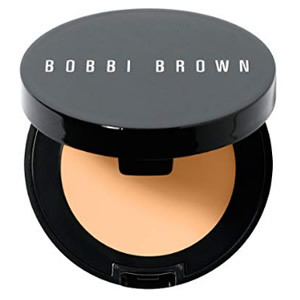 This creamy concealer from Bobbi Brown keeps you looking refreshed and well-rested. This skin product has yellow as a color base, and it camouflages dark circles and any skin breakouts or blemishes well. You can use it anytime for a quick, effective facial touch-up. This enriching formula is easy to apply. It blends well on your skin and stays exactly where you put it on your face. Abundant with skin refiners and conditioners, this concealer also protects delicate skin tissues beneath your eyes for a younger, fresher complexion. Your best shade of Creamy Concealer will be one shade lighter than your foundation color. There is never any problem with this product creasing or developing blotchy, dry patches after application. This concealer goes on smoothly for a sheer look while ensuring excellent and complete coverage of facial skin imperfections. Ingredients of this rejuvenating skin concealer and moisturizing include petrolatum, a refined form of petroleum jelly, which smooths and hydrates your face skin. Refined petroleum jelly is not known to have any health risks for daily use on the skin. Other formula components includebis-diglyceryl polyacyladipate-2 and tribehenin. Bis-diglyceryl polyacyladipate-2 contains a series of fatty acids and acts as a skin conditioner and emollient in this concealer. It is frequently used in place of lanolin in modern cosmetic and skin care products. Tribehenin is a skin conditioning substance that produces a protective barrier on your skin's surfaces, impeding water evaporation and helping to keep your facial skin well hydrated. This creamy concealer blends with your skin tones to look invisible while covering skin imperfections. Just a few light dots of this concealer beneath your eyes will conceal all traces of dark circles. Customers comment that this product conceals well while hydrating your skin and helping your facial tissues to stay moist and refreshed. Users report that this concealing agent is an ideal choice for daily use on dry skin. A few customers reports experiencing some creasing around the eyes when using this skin concealer. 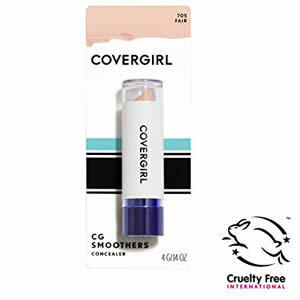 This solid stick concealer from Covergirl is lightweight yet effectice in covering lines, wrinkles or red patches of dry skin while soothing and moisturizing you face. This product contains ginseng, Vitamin E and chamomile, all of which will clear, hydrate and refine your skin. Ginseng works to soothe and alleviate dry skin as an anti-aging component and a skin rejuvenating agent. Vitamin E hydrates and softens your skin while healing any breakouts and fading any lines or imperfections. Chamomile is known for its action as an antioxidant and anti-inflammatory throughout the body, including the skin tissues. It will help prevent and eliminate any skin rashes, breakouts or acne occurrences that may affect the facial skin. This light yet excellent quality concealer can give your face a flawless look and radiant glow with just a few light dabs under your eyes and on any red, darkened or patchy areas of facial skin. There is no need to rub this product into the sensitive skin tissues of the eye zone as this can irritate these sensitive areas. Just with light blending, you can achieve a professional, stylish yet healthy looking complexion. When applied lightly and evenly this concealer will not streak or appear caked or flaky. Your face will stay moisturized and fresh looking all day long and into the evening. This concealer can be used near your eyes without any itching, burning or watering of the eyes. The gentle composition of this product makes it suitable for use on all skin types, although it is especially helpful to dry skin. This Covergirl concealer is just as effective as it was in past years, according to some long-term users of this product. Some customers report liking this solid stick concealer better than liquid concealers since it does not crease as some of the liquid products so. Customers are pleased with the long-lasting effects of this concealer. Although this concealer is in stick form, it has a smooth, creamy consistency for easy use. Some users found the "fair" shade of this concealer to be much lighter in color than expected, so they needed to order a darker shade to mix with it. 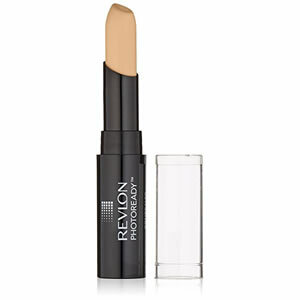 This luxurious, creamy concealer formula from Revlon offers a seamless, professional look of sophistication for your face. It successfully camouflages any skin flaws with medium level coverage that glides on effortlessly. The applicator is designed with an angles tip for precise, even coverage. This product was created with use of High-Definition Filter Technology to transform any imperfections as it softens and conceals imperfections of a smooth, professional look. This product was designed specifically to provide you with instant perfection for a glowing, youthful complexion. Formulated for build-able coverage, this concealer will fade and cover just as much as you want it to without giving a heavy or overly applied appearance. It has a truly feather-light look and feel. ctive ingredients of the innovative formula are Octinoxate (Ethylhexyl Methoxycinnamate) and Titanium Dioxide. Octinoxate, or Ethylhexyl Methoxycinnamate, is an ester and an organic compound that is used frequently as a component of sunscreen and lip balm formulas. It is insoluble in water and protects the skin by helping to revitalize, moisturize and soothe rough, patchy or itchy skin. Titanium Dioxide is a natural mineral ingredient of this formula. It is included in this concealer as a white pigment that is safe for use on your facial skin. 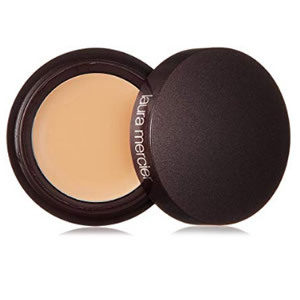 This concealer has a pleasant, creamy texture and is easy to apply smoothly. One customer reports that her first tube of this effective concealer lasted for more than a year of regular use. Some customers report using this concealer as a skin brightener as well, with good results. Several users report having bought this concealer as a substitute for the product they always used and deciding to make a change to this Revlon product. Some users report that this Revlon Photoready concealer makes you anything but photo-ready since it give users a ghostly appearance while streaking and caking. 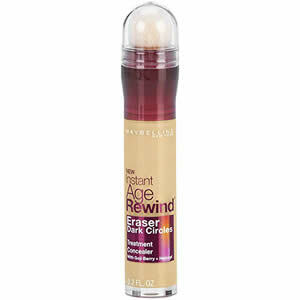 This "Instant Age Rewind Dark Circles Treatment Concealer" is to erase dark under-eye circles, fine line and wrinkles while reducing eye zone puffiness. This product contains natural goji berry that provides strong antioxidant protection from free radical damage to your skin while softening, hydrating and plumping your delicate face tissues. The ingredient of Haloxyl raises levels of blood circulation throughout your body, giving your skin more elasticity and younger, more vital look. This concealer has an updated micro-corrector applicator for easy, precision application. This concealer vitalizes and illuminates the under-eye skin, fading any signs of darkened or red skin patches. Available in 12 different skin tones, this product is designed to keep your complexion looking fresh and radiant all day and night with a single application. It can be helpful to apply the neutralizer shade for darkened skin areas and the illuminating shade for brightening your face. The result will be a smooth, youthful and more flawless complexion. The applicator micro-fills small lines and imperfections, smoothing and concealing them completely. The overall result is a look of radiant, glowing sophistication and style. This concealer is popular, especially for its skin brightening and illuminating properties as well as its capacities to conceal skin flaws. Some users are pleased with this concealer's ingredients of natural goji berry and Haloxy for improving skin quality and elasticity. New customers like the way in which the applicator for this concealer micro-fills small lines and flaws of the face, causing them to fade. This product is sold in pharmacies and discount convenience stores, but is not available in many cosmetic stores and online cosmetic and skin care web stores and marketplaces. With a light stroke of this Concealer Wand, you can enjoy precision application of this quality, lightweight concealer to mask any facial skin flaws. It is sold in 12 or more color shades, so there is sure to be one just right for your skin tones. This product is very popular since it is easy to apply and blend for full, smooth coverage. Just dot a small amount on skin surfaces and blend with a brush or your fingers, after washing your hands. Along with varied skin tones, this product is available in correcting colors. For example, Green will disguise skin redness, Lavender will vitalize any skin dullness and Yellow will neutralize darkened skin tones and under-eye circles. Ingredients of this modern skin concealing agent include Trimethylsiloxysilicate, Sorbitan Olivate and Coconut Oil. Trimethylsiloxysilicate is a silicon-based polymer that is used in cosmetic products like this concealer as a skin conditioner. It is considered safe for use on delicate facial skin and in addition to concealing flaws and improving skin quality, it forms a barrier on skin surfaces for retaining water for hydration. Sorbitan Olivate is a natural emulsifier made from olive oil that decreases water loss from the skin while moisturizing dry skin. It is hypoallergenic. Coconut Oil acts as an emollient, smoothing and softening facial skin. This concealer masks skin flaws nearly effortlessly with use of its applicator wand. Customers report that the color-correcting feature offered by this product works very well. New users of this concealing wand report that the hydrating action of this product is very good. Although it is recommended, some users report having difficulty mixing skin tone shades of this concealer to get their best color for use. When shopping for the best concealer for dry skin today, consider the different forms they are available in, such as liquid, creamy, stick or dispensed by a contemporary wand applicator. 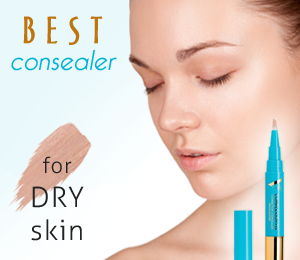 You may also want to examine concealer products that offer the airbrush effect. 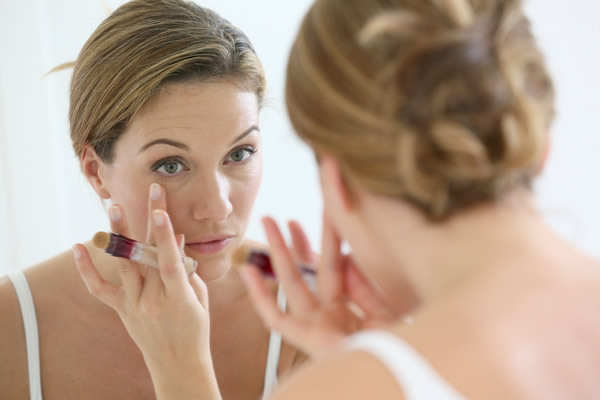 Of major importance when selecting your new concealer for dry skin is the list of formula ingredients of each product and the effects these components can provide. When you locate the concealer that offers the most healthy benefits for your dry skin and is produced in your favorite form for easy daily use, you will be well prepared to make you very best product selection.